(Newser) – Bill Gates has long been a philanthropist through the Bill & Melinda Gates Foundation, donating millions to combat diseases and poverty. 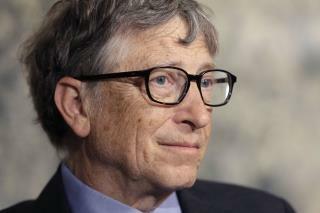 But the Microsoft co-founder has now decided to make a personal donation of his own. A big one. Gates says that he will be donating $100 million to fund research to bring about an end to Alzheimer's disease, Reuters reports. That donation will come in two parts. Fifty million to the Dementia Discovery Fund, which combines government and industry resources to seek treatment for the disease, and $50 million to Alzheimer's research start-ups. Currently there is no treatment that slows Alzheimer's, only medications to ease some of the symptoms of the brain-wasting disease. “I hope that in the next 10 years that we have some powerful drugs, but it’s possible that won’t be achieved," Gates says. And yet libtards would rather Gates was taxed to high heaven so the government could piss away some more billions on illegals or layabouts. Because the disease doesn't care who or how rich you are.